30 years after fatal bombings, Dorie Olds manages to leave the past behind. Trent Nelson | The Salt Lake Tribune Dorie Olds is the ex-wife of Mormon bomber Mark Hofmann, who killed two people on Oct. 15, Trent Nelson | The Salt Lake Tribune Dorie Olds is the ex-wife of Mormon bomber Mark Hofmann, who killed two people on Oct. 15, Tribune file photo Mark and Doralee Hofmann attend board of pardons hearing in this undated photo. 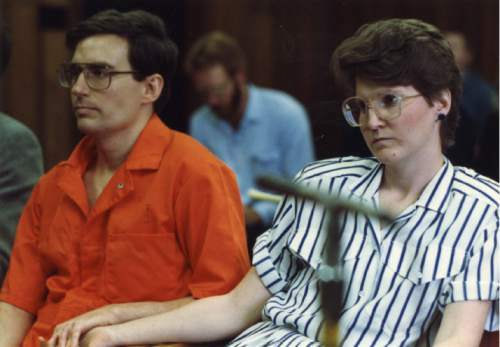 Trent Nelson | The Salt Lake Tribune Dorie Olds is the ex-wife of Mormon bomber Mark Hofmann, who killed two people on Oct. 15, 1985. 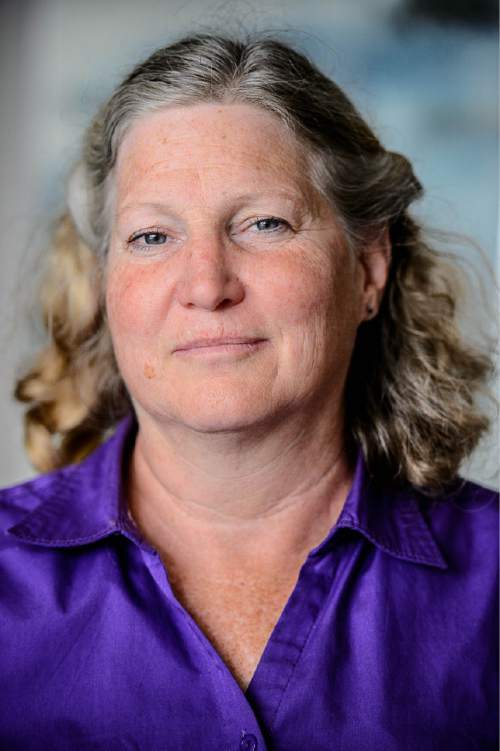 She spoke of her life and what has happened in the 30 years since one of Utah's most infamous crimes, Thursday October 8, 2015. Trent Nelson | The Salt Lake Tribune Dorie Olds is the ex-wife of Mormon bomber Mark Hofmann, who killed two people on Oct. 15, 1985. She spoke about her life experience Thursday October 8, 2015. Tribune file photo Mark and Doralee Hofmann attend board of pardons hearing in this undated photo. Two Mormon wives sat on opposite sides of the Salt Lake City courtroom, staring intently at images on a screen as a witness described Steve Christensen&apos;s body after a pipe bomb shredded it. On one side was Terri Christensen, widow of the businessman, who was murdered Oct. 15, 1985. Across the aisle was a pregnant Dorie Olds, then-wife of Mark Hofmann, the LDS forger who was accused of the heinous act. As the witness detailed her experience of finding Steve Christensen, lying in the hallway, emitting moaning sounds like a little child crying, his wife began to weep quietly. By the end of that third day of the April 1986 preliminary hearing about the crimes, Hofmann&apos;s wife fled the courthouse and never returned. The Mormon world was rocked by Hofmann&apos;s double-dealing and deceit, but even more horrified by the deaths of Christensen and Kathleen Sheets, wife of Christensen&apos;s business partner, Gary Sheets. Olds&apos; life, too, had exploded with her husband&apos;s bombs, shattered like shards of glass. As the news unfolded on the nation&apos;s television screens, reporters camped out on her lawn in Millcreek, peering in the windows at the distraught woman, trying desperately to care for her young children. Some former friends in her Mormon congregation shunned her, she says, believing she had been an accomplice to his crimes  an accusation she adamantly denies. Her LDS stake president refused to shake her hand, she says, and her kids were mocked for having a dad in jail. In 1988, Olds divorced Hofmann, who pleaded guilty to murdering Christensen and Sheets as well as forging dozens of documents and is incarcerated for life at the Utah State Prison. She hasn&apos;t spoken to him since the split was final (though they have exchanged letters about the children and other issues). Without a college degree or means of supporting herself and her four children, Olds had to give up the house they lived in and eventually farmed out the youngest kids to relatives, when she felt the children no longer respected or listened to her. For a time, she grew her own food and tried her hand at selling magnetic beds. She felt largely alone, rejected by many, including her in-laws and some of her own family members. Slowly, though, Olds developed a few close friendships, a deep mysticism and a knack for analysis and therapy. Now, 30 years of tortuous living later, Olds is finally at peace with herself and all that happened. She is working on a book, "The Forger&apos;s Wife," and hopes to help women who look and act like her former self. "I see their pain, their stuckness. They have done the best they can with where they are, and I can now give them true love and compassion," says Olds, who works as a life coach and hypnotherapist. "Only to the extent that I truly love myself can I truly love another." Such self-awareness is far from where she began. Undercurrents • On the surface, Dorie Olds&apos; childhood in Salt Lake City&apos;s Sugar House neighborhood seemed fairly typical for Utah Mormons. Pioneer ancestors. Four siblings. Devout grandparents. Stay-at-home mom, who baked bread and quilted. Underneath, though, Olds felt something amiss. She believes that her mother didn&apos;t really want her. It left her feeling confused, unloved and suicidal  but she had no words. She blamed herself. After completing two years at Dixie in St. George, in fall 1978, Olds went to study nutrition at Utah State University, where Mark Hofmann lived in an apartment above hers. He had recently broken his engagement, and the two became friends. He was smart and interesting, and they enjoyed long conversations. Their first romantic date was in April 1979, their engagement was in July and by September they were married. "I didn&apos;t feel loved, but I did think he would be my savior," Olds says now. "He would save me from my family." She had no idea, she says, that her husband had been forging documents and counterfeiting coins since he was a teen, maybe younger. She does recall, however, a chilling moment when his sister asked: "Why do you want to marry him? He&apos;s mean." Olds quit school to support her husband, who claimed he was a pre-med student. A few months later, he came home with a 17th-century Bible and urged her to look through it  something he had never done before. Sure enough, Olds "discovered" a piece of parchment gummed into the Bible, with Egyptian-looking scribbles on it. Hofmann excitedly identified it as a copy of the so-called "Anthon Transcript," with hieroglyphic markings that LDS Church founder Joseph Smith said he copied from gold plates in the 1820s. Smith had given a page with such script to an early Mormon convert, Martin Harris, to show to Charles Anthon, a scholar of ancient languages. Within a short time of the find, Hofmann was photographed gave the document  later determined to be a forgery  to The Church of Jesus Christ of Latter-day Saints for $20,000 worth of items. "He set me up. I was the witness  and entangled in it," Olds says. "I felt something was off, but I didn&apos;t know what it was." The Anthon discovery created a stir in the Mormon historical community, and Hofmann told his wife he was quitting school to collect rare documents full time. Within a few years, he had a booming business, "finding" little-known and remarkable documents with surprising frequency. Some items commanded large sums, but even the smaller ones brought acclaim. "Unknown to me, Mark had forged his first coin at age 14, long before we were married," Olds told a recent gathering of women. "During our nine-year marriage, he created historical documents and signatures, coins, antique Mormon money and much more ... selling them for millions of dollars." Olds, meanwhile, was the dutiful wife, caring for their home and growing family ­ at that time a son and two daughters. Though she occasionally felt a vague unease about her husband&apos;s work, she acknowledges she asked few questions about his business. "She seemed to fill traditional if not stereotypical familial roles: primary caregiver to the children, made most meals [cleaned up afterward] overall errand runner," says Mormon researcher and Hofmann friend Brent Metcalfe. "She was fairly outgoing, but didn&apos;t seem interested in Mark&apos;s document dealing." Curt Bench, owner of Benchmark Books and a rare-book and document collector, concurs. "I always liked Dorie. She was very friendly when we did things socially [as couples] sometimes," Bench recalls. "But I never felt she had much interest in what Mark was doing and not aware of a lot of his work." What if Olds had questioned her husband about his suspicious dealings? "I was asleep all those years," she says. "If I had awakened earlier, I might have ended up dead." Like Steve Christensen and Kathleen Sheets. That October morning • By 1985, Hofmann had gotten himself into a financial tangle and needed a way out  or at least buy some time. The forger had promised various buyers  and pocketed more than $100,000 from each  a collection of journals and letters from an early Mormon apostate, William E. McLellin. Hofmann had no such collection, nor the time to produce one. So he devised a scheme to kill two people as a "diversion," which he hoped would throw at least the LDS Church&apos;s attention off of him. When Olds awoke that morning, she says, her husband was already dressed and, strangely, in the backyard, wearing his green Olympus High letter jacket. There was "no sign, no indication, no materials around" that would give her a clue about his crimes, she says. "He was acting the same. Normal." That was how she could testify that he was home that day and pass several lie-detector tests. The next day, Olds planned to clean her house, she says, when she got a call from Hofmann, telling her that she and the kids were in danger and that she should take them to her mom&apos;s house. While there, she heard that her husband was wounded and rushed to the hospital after a bomb went off in his car. When she arrived, his parents were already there. Police then began investigating Hofmann himself as a suspect, and, in one moment at the hospital, she looked up to see detectives on the TV screen going through "my messy house." Olds went into the hallway for a moment of prayerful silence. She felt she received a divine message: "It will be all right." A life sentence • After Hofmann pleaded guilty to the crimes in January 1987, Olds was left with four children ages 5 and under  a third daughter was born between the bombings and sentencing  and a million dollars of debt. Yet, she still defended him. She believed he was, indeed, a liar and a cheat. But she couldn&apos;t accept the idea that the man who had fathered her children and shared her life could have killed so coldbloodedly. She continued to visit him twice a week in prison, once alone and once with her children. Finally, the reality of his murderous nature seeped in as she continued to meet with him, and she came to believe that he was guilty. In 1988, Olds filed for and was granted a divorce. Since then, Olds has had to rebuild her identity  brick by brick. "I had to learn how to accept and love myself enough to keep a boundary, rather than shrinking in fear of authoritarian dictates, or passively going along with situations in which I saw no choice," she says. "I had to learn that I had value, a right to choose for myself what I felt to be right, and that my voice should be heard." Olds wanted to start healing other people, says longtime friend Sylvia Gregerson, who met the bomber&apos;s wife after the crimes, "to try and heal herself." In 1999, Olds joined Gwyneth McNeil at Utah&apos;s Academy of Life Management using hypnosis, Reiki, light and sound, breath walking and life-path coaching to help clients cope with stress and learn to love themselves. "When I first met Dorie, she was very mousy," McNeil says. "She didn&apos;t speak her truth but would waffle all over the place when she spoke." Since then, McNeil has seen Olds reach more deeply into her own psyche, past and needs, and come out in a better emotional and spiritual place. "It is where she always wanted to be," McNeil says, "but didn&apos;t know it was possible." Olds, too, has regained  and even deepened  her Mormon faith. She feels accepted and welcomed into an LDS congregation in Holladay, where she recently was asked to give a short talk. She spoke for 25 minutes without notes, telling her story to many who didn&apos;t know anything about it. Now, Olds says, her fellow Latter-day Saints treat her like a "rock star."